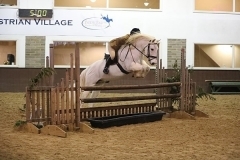 Stallion, mare or gelding, five years old and over, exceeding 133cms but not exceeding 143cms. Minimum height of fences 80cms. Maximum height 95cms. Maximum spread 80cms.